In classroom teaching, teachers make increased use of collaborative learning and educational technology to enhance the learning experience of students. 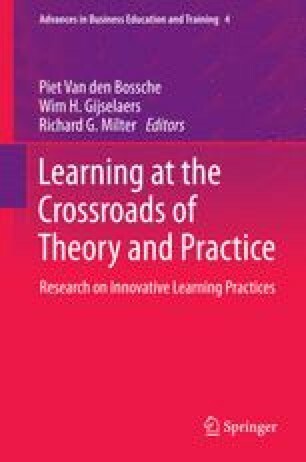 Most researchs on team-learning focuses on learning within teams. However, to what extent do learners share knowledge inside and between teams during a course? This study took place in a third-year course on international economics, whereby 57 students were divided into 11 teams and learned and collaborated in an innovative blended learning environment. A mixed-method approach of social network analysis (SNA) techniques was used to measure learning within and between teams in a longitudinal manner. Afterwards, a qualitative critical event recall of the teacher was used in order to reflect upon the results of the SNA. In this explorative study, the results indicate that knowledge spillovers across the teams do occur over time. All the 11 teams developed outside links to other teams after 14 weeks. While some teams established a lot of knowledge spillovers with other teams, other teams primarily learned within their own team. Finally, the critical event recall by the teacher illustrated that teams who had strong beliefs in the capabilities of the team over time developed a strong mutually shared cognition. Our results indicate that using SNA in classrooms can help teachers to enhance their understanding of learner and team-interactions.